When Scarborough claimed the A Grade Premiership on Saturday afternoon at Steel Blue Oval it was the first time they have held the Sandover Shield since 1998. 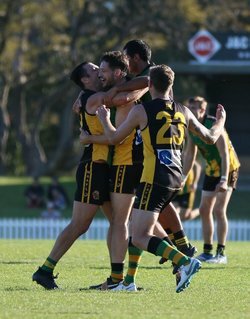 Scarborough went into the match as favourites over Fremantle CBC after finishing the season as minor premiers with just one loss for the year. With Fremantle CBC making their first A Grade Grand Final in 15 years the stakes were high for both sides who were keen to end Premiership droughts. Scarborough wasted no time getting on the scoreboard kicking the first three goals of the match before Fremantle CBC fought back with two goals of their own. 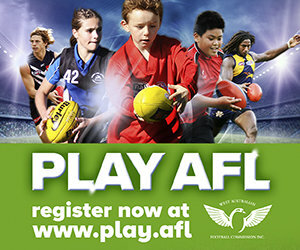 Fremantle CBC’s Jacob Green kicked the first goal of the second quarter to level the scores before Scarborough aimed to respond quickly however Sam Davies celebrations were cut short after his kick was touched off the boot. It was goal for goal at the start of the third term with Scarborough’s Marc Re kicking his first of the afternoon before Jacob Green kicked his fourth major to keep Fremantle CBC's hopes alive. Scarborough kicked their tenth goal late in the third quarter when Marc Re produced a sublime bouncing goal to give his side a 26-point lead. The goal was produced by a clever tap from Michael Cooper to Jordan Adamson-Holmes who bounced the ball in Re’s direction. The Sea Eagles kicking a further three goals in the fourth quarter to seal the 14.7 (91) to 7.3 (45) victory, a 20-year drought broken and the Club's fourth A Grade Premiership. Scarborough have faced Grand Final heartbreak twice in recent years with a one-point loss to Hamersley Carine in the 2015 B Grade Grand Final before they were defeated by Trinity Aquinas in the 2016 A Grade Grand Final. Scarborough president Ben Walker said “It has been an amazing feeling and everyone who has been involved and supported the club deserves the reward. To come from C grade 9 years ago and slowly build the club back to an A grade premiership club isn’t easy and I know everyone involved is so happy we have finally done it. The feeling in the rooms when the song was sung said it all. Relief and joy all at the same time”. “The playing squad as a whole is so close and a great group of mates so you can imagine the celebrations have been great fun and the boys will make sure they continue that for a while to come! We should be able to keep the group together and look forward to a big 2019. But in the meantime, we will saviour this moment for sure” said Walker. Joel Ashman took out the BJ Giles Medal as the Best on Ground capping off an outstanding season which also saw him claim the CJ Jamieson Medal a fortnight ago as the A Grade Best and Fairest. 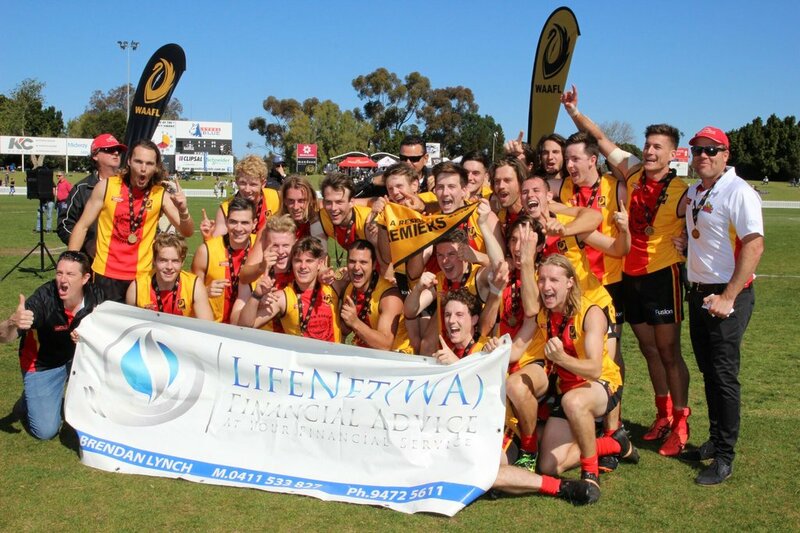 In the A Reserves North Beach claimed back to back Premierships defeating Trinity Aquinas by 13 points. It was a low scoring match with North Beach kicking just the one goal in the first quarter and a further two in the second. Early in the third quarter North Beach pushed their lead to seventeen points before finishing the quarter 22 points in front. North Beach running out 7.7 (49) to 5.6 (36) winners. 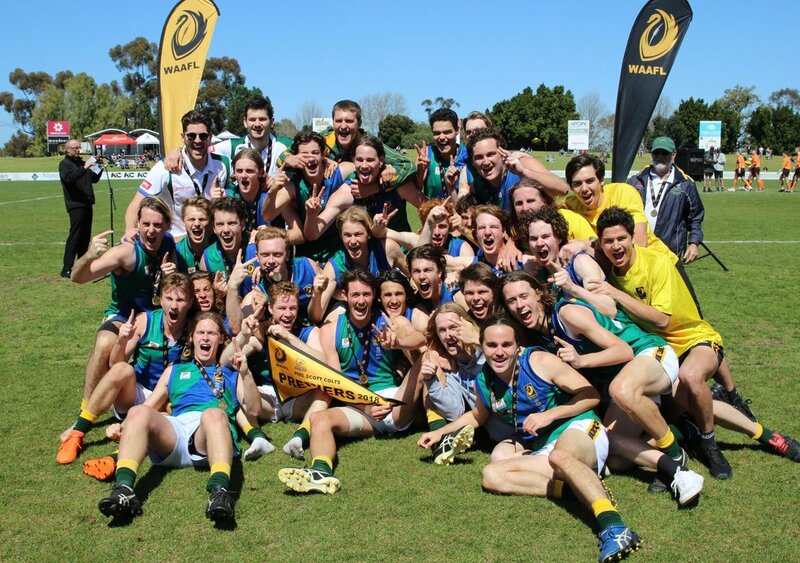 In the Phil Scott Colts University also claimed back to back premierships defeating North Beach earlier in the day. The North Beach Colts looked ready to fire turning up early to the ground to ensure they had adequate time to warm up. North Beach came out and kicked the first goal of the match but unfortunately, they only managed three goals for the day to give University their fifth Phil Scott Colts premiership in six years. Inaccurate kicking from University meant that the 6.14 (50) to 3.0 (18) victory could have potentially been much greater.